© World Academy of Science, Engineering and Technology 2009. With the wealth of image data that is now becoming increasingly accessible through the advent of the world wide web and the proliferation of cheap, high quality digital cameras it is becoming ever more desirable to be able to automatically classify images into appropriate categories such that intelligent agents and other such intelligent software might make better informed decisions regarding them without a need for excessive human intervention. However, as with most Artificial Intelligence (A.I.) methods it is seen as necessary to take small steps towards your goal. 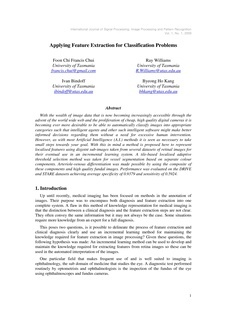 With this in mind a method is proposed here to represent localised features using disjoint sub-images taken from several datasets of retinal images for their eventual use in an incremental learning system. A tile-based localised adaptive threshold selection method was taken for vessel segmentation based on separate colour components. Arteriole-venous differentiation was made possible by using the composite of these components and high quality fundal images. Performance was evaluated on the DRIVE and STARE datasets achieving average specificity of 0.9379 and sensitivity of 0.5924.